The money market and financial system of a country are directed, monitored and controlled depending on which bank is called central bank. Central banks are bankers’ banks, and these banks trace their history from the Bank of England. They guarantee stable monetary and financial policy from country to country and play an important role in the economy of the country. Typical functions include implementing monetary policy, managing foreign exchange and gold reserves, making decisions regarding official interest rates, acting as banker to the government and other banks, and regulating and supervising the banking industry. These banks buy government debt, have a monopoly on the issuance of paper money, and often act as a lender of last resort to commercial banks. The term bank nowadays refers to these commercial banks. The Central bank of any country supervises controls and regulates the activities of all the commercial banks of that country. It also acts as a government banker. It controls and coordinates currency and credit policies of any country. The Reserve Bank of India is the central bank of India. Banking means accepting deposits of money from the public for the purpose of lending or investment. Commercial Banks provide financial services to businesses, including credit and debit cards, bank accounts, deposits and loans, and secured and unsecured loans. Due to deregulation, commercial banks are also competing more with investment banks in money market operations, bond underwriting, and financial advisory work. Commercial banks in modern capitalist societies act as financial intermediaries, raising funds from depositors and lending the same funds to borrowers. The depositors’ claims against the bank, their deposits, are liquid, meaning banks are expected to redeem deposits on demand, instantly. Banks’ claims against their borrowers are much less liquid, giving borrowers a much longer span of time to repay money owed banks. Because a bank cannot immediately reclaim money lent to borrowers, it may face bankruptcy if all its depositors show up on a given day to withdraw all their money. The bank which performs its activities for the development of agriculture and agro based industry is called agricultural bank. such as Bangladesh krishi bank, agricultural bank of India. The bank which is engaged in providing loans and investment its money for development, expansion & establishment of industries is called industrial bank. Such as BDBL. Bank which plays a great role to the development of transportation areas is called transportation bank. There is no transportation bank in Bangladesh. This is why commercial bank performs such office. Such bank is concerned to help in transactions through foreign exchange is called exchange bank. An exchange bank primarily finances the foreign trade of the country. These banks will be available in more than a single country. They provide services for the buying and selling of gold and silver; transactions will be in foreign currencies. This bank is related to provide finance and loan for development of small and cottage industry. Such as- BSCIB, BASIC bank ltd.
An investment bank is a financial institution that assists individuals, corporations and governments in raising capital by underwriting and/or acting as the client's agent in the issuance of securities. An investment bank may also assist companies involved in mergers and acquisitions, and provide ancillary services such as market making, trading of derivatives, fixed income instruments, foreign exchange, commodities, and equity securities. Investment banks aid companies in acquiring funds and they provide advice for a wide range of transactions. These banks also offer financial consulting services to companies and give advice on mergers and acquisitions and management of public assets. Such as- ICB, ICI. These banks exist for a long time. They promote investing in organizations that reap huge benefits for a long time rather than brand new organizations. It does acts for development of business, industry and commerce. At fast it identifies the areas of various business and after that provides capital to these areas. Retail banks provide basic banking services to individual consumers. Examples include savings banks, savings and loan associations, and recurring and fixed deposits. Products and services include safe deposit boxes, checking and savings accounting, certificates of deposit (CDs), mortgages, personal, consumer and car loans. These banks are suited for employees with a monthly salary. Low waged people may open an account in the savings bank. These banks are committed towards enhancing the growth of industries by providing loans for a very long period of time. This is vital for the long term growth of the industries. These banks promote growth in the food sector, by giving loans to farmer at a relatively lower interest rate. The loan is usually given on the basis of land. If a farmer has lots of agricultural fields then the more will be the loan provided. Bank which relates to the development of socio - economic conditions of remote or rural. Selecting various projects to improve the luck of rural poorer, this bank gives loan to those and creates sectors of work. These banks are specialized in providing mortgage loans alone. In order to sell loans they depend solely on the secondary market. The bank that are engaged in development of export-import trade. It acts for creating, expansion and development of employment. Native banks. They are normal moneylenders; only this time, handling huge amounts of money. They collect money from the community and provide loans to business men and industrialists for a short amount of time. These banks are present in Norway. They promote both savings and commercial facilities to the both people and organizations in Norway. These banks control the principles and policies of other banks across the country. These banks are managed and run by the government. This bank provides benchmarks which other banks should follow. They act just like a co operative bank except that they provide services to only one employee union in the community. Low interest rates and easy instalment paybacks are features of this bank. These banks are oriented with postal services. People save money for a defined period of time and are paid with standard interest rates. They are also private banks except that they have little tax to pay for their transactions; there is very little regulation for this bank. As the name implies ethical banks promote candid transactions; between various customers of the bank. Policies and rules are transparent in nature. These banks have a wide spectrum of financial assistances to provide. Insurances to stocks, they promote everything across all countries around the globe. These banks are based on the principles of the religion Islam. There are no interests for loans acquired from this bank. Service charges may apply. x) Community Development Bank : These banks provide services to the community; where there has been nothing or very little development over the years. The bank which works for development of any special areas or region is called regional bank. Such as - ADB. This bank works for internationally development is called international bank. Such as- World Bank. This bank acts for labours so that they should be motivated to savings and may test welfare. The bank which is directed to influence woman for savings and to make transaction too easy. The bank which is established and directed to influence students for savings and to make transaction too easy. These are consumer friendly banks; they encourage the consumer in buying commercial products and provide options for easy repay of the loan amount. Banks that sell their services through one full-service Office. It has unit office, particular area, centralized administration, limited capital, efficient management, rapid decision power, freedom with easy formation, more safety. * Centralized administration and policy or plan making as well as direction. * Govt. And non-govt. company ownership. * 10 millions authorized and paid up capital. * Deposits are collected and advancing are provided from various branches around the country or out of country. * wide scope of operations. Group banking is a group of banks are brought under a centralized management and this centralized management experts control over all the units. It is a legal form of bank organization in which two or more independently incorporated banks are controlled by holding company. 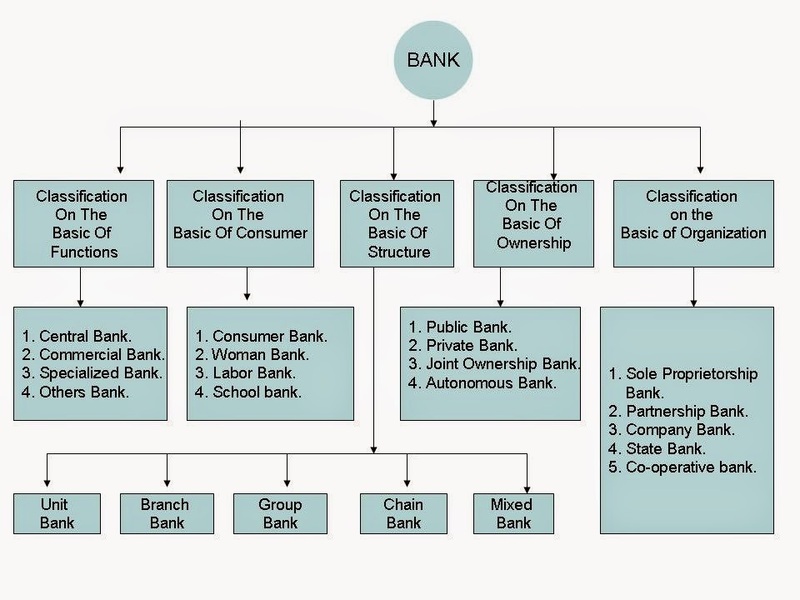 Chain bank is a type of multiple office in which the operations or policies of at least three independently incorporated banks are controlled by one or more same individuals. This is both commercial and specialized banking format. Mixed banking system refers to that banking system under which the commercial banks make long term loans to industries. Public sectors banks are those in which the government has a major stake and they usually need to emphasize on social objectives than on profitability. Private sector banks are owned, managed and controlled by private promoters and they are free to operate as per market forces. The bank which is established, formed and directed by both govt. and private ownership. The bank which is established under special acts and controlled by own self is called autonomous bank. This bank is established, formed, organized, directed and controlled under sole ownership. This bank is established, formed, organized, directed and controlled under partnership act and law. There is no partnership bank in our country. This bank is established, formed, organized, directed and controlled under company act and law. Most of the bank in this world are company bank. This bank is established, formed, organized, directed and controlled under state ownership. All responsibilities and liabilities of such bank are on government of the state. co-operative banks as the name suggests gets money from the general community without any bias and provide loans to all sections of people in the neighbourhood. Their motto is not profit alone, but service. This bank is established, formed, organized, directed and controlled under cooperative act or law of that country. At last we con say that, the above are some of the types of banks around the globe. They may be further classified according to their roles and system. Yes it is true because banks have many different categories. These categories are mention here because here is some superiorpaper difference in between them. Which is good to your information.